Tamar Guimarães, Canoas, 2010, 16 mm transferred to HD video, color, sound, 13 minutes 24 seconds. 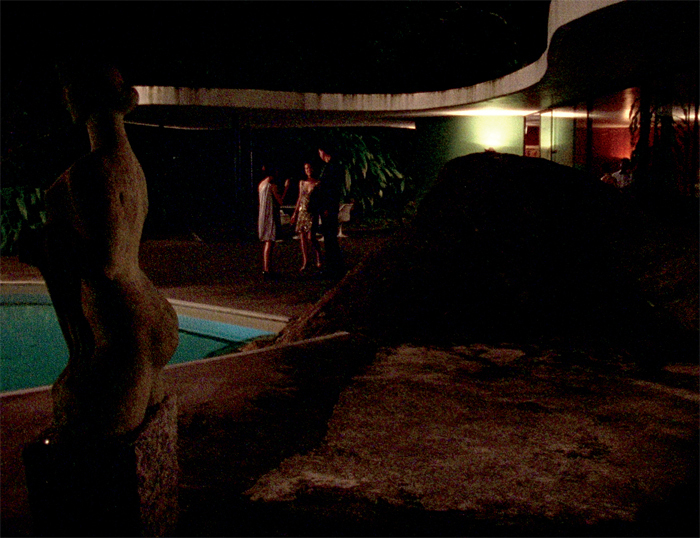 CANOAS WAS A FILM I shot for the São Paulo Bienal in 2010. I was thinking of biennials as a series of collective exercises in the projection of national identity, and I became interested in the ways in which the Casa das Canoas, the house that architect Oscar Niemeyer built for himself in Rio in the early 1950s, had achieved iconic status in Brazilian cultural lore. I had read that after it was built, particularly during Juscelino Kubitschek’s presidency (1956–61), the house had not only provided a location for important cultural gatherings but, through its tropical sensuousness, had helped establish the myth of Brazil as an emerging modern paradise, serving as the postcard of a country yet to be.